Discretely placed into the lobby of a small, mid-century, low-rise brick office tower is a new public gallery. The grand opening will take place this evening (January 22nd), between 5:00-7:00 pm in the lobby of 505 – 8 Avenue SW.
Having said that, this space has been used for this gallery purpose since mid-November 2014. I understand that the exhibitions will rotate on a three month cycle in the future like many public galleries. The location of this space is directly across the street from Holt Renfrew, between Eight Avenue Place and Barcelona Tavern (where the former restaurant Belgo used to be) which is right next door in the same building. This is the first such “public” gallery that has opened in the city in a long time. There is nothing to adequately compare this new space to. It does share some similarities to the most recent “public” gallery that has opened in the city – the Esker Foundation. However, on a different level the model between the two, is certainly much different. In this case the organization behind this new space is a local foundation that began in 1946 at the end of World War II, under a different but related name. It is now operating as it has since the summer of 1959 as the Calgary Allied Arts Foundation. The Calgary Allied Arts Foundation’s influence in the city has been profound. Full disclosure here: I have been a past board member of this organization. I also co-curated an exhibition held at the Art Gallery of Calgary (now known as Contemporary Calgary) in 2009 to celebrate the foundation’s 50th anniversary. In addition, I was the motivating factor for a new endowment created for the 50th anniversary (called the “Calgary Allied Arts Foundation Civic Art Collection Fund”) which is administered and can be funded through the Calgary Foundation using this page, searching the drop-down menu of all funds for the fund name mentioned above. As a result of the extensive original research I did for the 50th Anniversary show (which in hindsight, I now recognize as not being entirely correct), I saw the necessity of further research and reminded the board of this fact, at numerous times when deemed appropriate at subsequent board meetings. At these times I suggested that a history of this organization should be created. I probably did this often enough that they got tired of hearing that it needed to be done, but in the end it finally stuck. This little fact resulting from my initial research for the AGC show was not fully correct, which led me to personally engage in a significant never-ending rabbit hole of research on Calgary arts organizations that I began in 2011 after my gallery closed. This research is still ongoing on a nearly full-time basis, if and when my sporadic work commitments allow. As a result and for obvious reasons, I am not going to talk much about the organization as a written history is currently being researched, produced and written and should be available near the end of this year. Notwithstanding my previous comments, CAAF is a volunteer driven organization that I am a huge fan of. At this time it is entirely funded by generous benefactors who over the past 50+ years have created endowments that allow the foundation to operate. These endowments allow the organization to create value in the community by encouraging those who work in the visual arts through various initiatives that they have undertaken over the years. These initiatives have included things such as funding purchases of public art; purchasing and donating artworks to the Civic Art Collection; establishing artist residencies; funding cultural initiatives such as ArtWeek and ArtWalk; engaging in advisory roles; and much more. As expected with a volunteer board, these initiatives reflect the interests of the board members who are predominately visual arts practitioners and reflect the political and artistic climate of the times. Needless to say, the Foundation has been around for a very long time. However, for a number of reasons which I could go into at great length, in recent history, it generally keeps a very low profile. This is very unfortunate as it should be known much more than it currently is. There is an interesting dialogue at play with this newly formed gallery, that has some interesting roots. It is this, that I would prefer to talk about at this time. As anyone in the city who has turned on the TV news lately, or talked to anyone working in the oil patch downtown, or read a news headline in the recent months would know, it is obvious that things could be economically better in the city. The headlines are stating things such as this one from the Calgary Herald “Oil services giant Baker Hughes to lay off 7000 workers“; this one from the Globe and Mail “Alberta’s oil woes: typical downturn or end of an era?“. Both of these headlines give a clue as to others. So reading that a corporation (in Calgary) is willing to underwrite the long-term costs of a new public art gallery at this time is very, very encouraging indeed. In the distant past, there is a bit of a tradition in Calgary that is being resurrected by this initiative. It is one that I am pleased to see. Long ago, we had companies such as Shell Canada, Petro-Canada and Gulf Canada Resources, all of whom had dedicated art gallery spaces available to both employees and the public alike. These galleries were all housed within their corporate offices. Other companies such as Esso Resources or Norcen Energy Resources (a company which gifted the large Bill McElcheran sculpture of the standing businessmen standing on Stephen Avenue Mall outside of the Hudson’s Bay Company to the citizens of the City of Calgary in 1981) had full-time staff to manage their collections and produced catalogues of their collections. These gallery spaces were staffed with curators and other related professionals (if required), catalogues were produced, and exhibitions mounted. Of course these days are long past. The physical shells of these spaces often still are visible and unless one knows what to look for and has a long enough memory of where they were located, most would not even know what once was located in those spaces. These spaces that once were, have been converted to other uses like office space, etc. and more often than not the collections have been sold or substantially diminished. 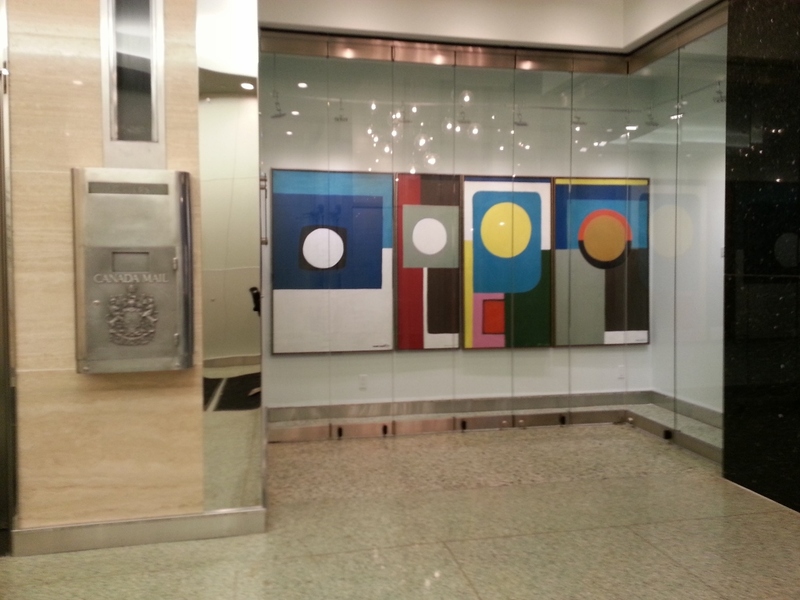 So seeing art in public spaces like what is found at the neighbouring building to the one that houses Gallery 505 – Eighth Avenue Place, warms my heart, just a wee little bit every time I wander through the lobby. This leads me to the single work that is shown above – a large, mature-period, four panel painting by Marion Nicoll entitled One Year, 1971. This was a gift of the Calgary Allied Arts Foundation to the City of Calgary Civic Art Collection two years after it was created in 1973. The selection of a major work by Marion Nicoll [1909-1985] is a very appropriate choice for the inaugural exhibition in this space. Having this work and a gallery for CAAF located in the lobby of a mid-century office tower that probably dates to around the same time as the Foundation was formed, is only further icing on the cake. The selection of this work recognizes her important contribution to the city of Calgary; the visual arts in the surrounding region; and her contributions in the field of education and arts development at the Alberta College of Art and Design and elsewhere in the city. It also recognizes the important financial contribution that both she and her husband Jim Nicoll (also an artist) made to the Calgary Allied Arts Foundation. As mentioned above, the endowment as bequeathed by Jim and Marion Nicoll provides a significant portion of the operating income for the Foundation. Recognizing her contributions, the Alberta College of Art and Design named the student gallery at the school in her name and honour. This work is a good example of her paintings that she was doing at the mature period after she had retired from active teaching in 1966. From sources that I believe dependable, it is my understanding that this work has been predominately in storage for the significant majority of the time that it has been housed in the Civic Art Collection. Surprisingly, it was not included in the major retrospective at the Nickle Arts Museum a year or two ago. No doubt this is partly due to its size and the difficulty in finding a space that can adequately display it to best advantage. Now that it has been put on display, I would think it will be more likely that it will now find itself a new home. Personally, I would like to extend my thanks and appreciation to the donor of the space where we can see works that might otherwise be hidden from view. I look forward to seeing more in this space in the years to come. This entry was posted in Alberta College of Art and Design, Art Gallery of Calgary, ArtWalk, Calgary Allied Arts Foundation, Contemporary Calgary, Corporate Public Art, Esker Foundation, Nickle Arts Museum, Progress, Public Art.